Welcome back to Nudgespotting! Today we’ll take a look at several attempts to make you a better driver and discover how creating a “simple” nudge can be a not-so-simple task. 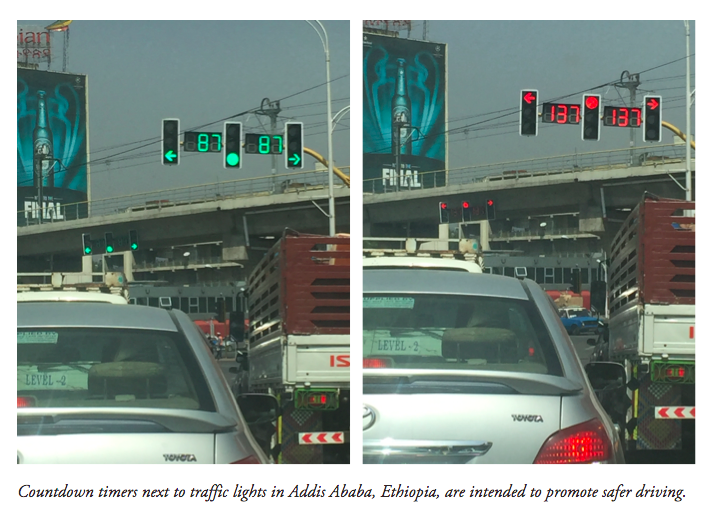 Recently, on a trip to Addis Ababa, Ethiopia, I was running late for a meeting. My taxi driver came to an abrupt halt at a red light and my eyes anxiously darted to the clock on my phone: how long would I be forced to wait? As if my mind had been read, I looked up to see that next to the red light was a timer displaying the seconds remaining until the light would turn green. I was immediately pleased to have my uncertainty alleviated, but later on I started wondering: are these timers nudging us to become better drivers? Or are they causing us to misbehave? Let’s investigate. Despite the fact that roughly 90% of U.S. drivers think they are safer and more skilled than the average driver, a surprising number of us run red lights: on average, this risky behavior causes two fatalities each day. Given what’s at stake, it’s unsurprising that urban planners and transportation officials have come up with several strategies to try to keep us safe on the road. If you live in the U.S., you’re probably familiar with – and perhaps occasionally frustrated by – red light cameras. Their omniscient eyes capture you in the act of running a light but punish you a few weeks (or months) later with a ticket in the mail. The specifics of their safety benefits are disputed, but it’s generally agreed that they can decrease right-angle collisions (caused by running a red light) and increase rear-end collisions (caused by abrupt stops at a red light), but the magnitude of each effect varies and ultimately determines their net effect on safety. This kind of “catch you in the act” enforcement punishes bad behavior after the fact rather than helping us make smart choices in the moment. It assumes we are rational actors who will optimize our behavior (run fewer red lights) if the cost of running one is increased. Meanwhile, it ignores the fact that many of us make a split-second decision to run a red light in the heat of the moment, without time for much weighing of costs and benefits. While this type of enforcement has been effective in some regions, it has also stirred up political controversy and led to at least half a million voided tickets because oferrors in the implementations of the cameras. Other countries (like Ethiopia) are trying a different approach and instituting countdown timers that provide information on cycle changes – the seconds left from green to yellow to red, and from red to green. Rather than establishing a costly and controversial system to punish you after the fact, they provide more information to help you optimize your “gun it” vs. “hit the brakes” strategy. But like red light cameras, this approach assumes we are rational calculators whose poor choices are due to a lack of information. The reality may be more nuanced. For example, we tend to proceed with caution when we face uncertain outcomes, such as when we don’t know exactly how much time is left until red and fear we won’t make it through the intersection in time. But when we know exactly how many seconds we have, we may throw caution to the wind as our overconfidence takes over. Thus, traffic light timers could actually make us more aggressive in our decisions at red lights. When we don’t know when the light will turn red, we’re not sure we can make it; when there’s 5 seconds remaining, well, we definitely can! 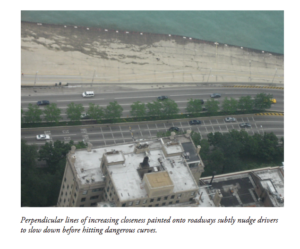 This certainty feeds our overconfidence and results in more drivers treating the parkway like the raceway. Regardless of the precise mechanism, the evidence suggests that something is going wrong, behaviorally-speaking: green to red countdown timers in Taiwan led to twice as many accidents as traditional traffic lights. If paternalistic punishment is unpalatable and information has unintended consequences, what option remains?